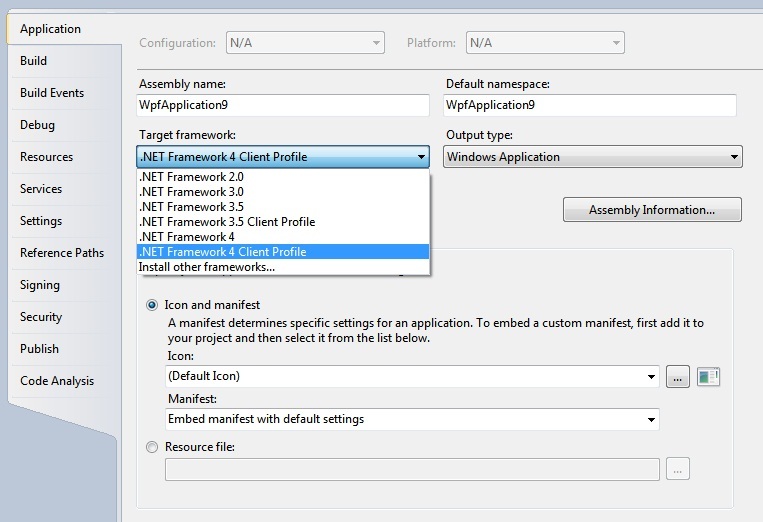 By default, when you build a WPF application using Visual Studio 2010, you target the .NET Framework 4 Client Profile. The client profile is a subset of the full .NET Framework 4 that includes only the pieces typically needed for Windows client applications. For example, it does not include support for ASP.NET applications. You can verify or change which version of the Framework a WPF project is targeting by looking at the Application tab of the Project Properties window. You can change your project to target older versions of the .NET Framework. You might do this if your application does not need features present in newer versions of the framework and you want to deploy to systems that already have the older version installed, avoiding a download of a newer version of the framework.